came early to learn and share recipe skills. Paulette showed her bread recipe, using an oven to bake the bread. Fruit bread loaf made from healthy, whole meal ingredients. 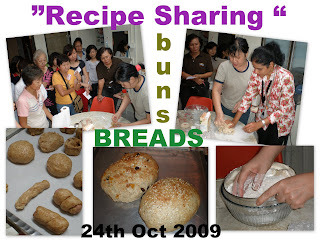 Many were thrilled and look forward to the next recipe sharing. Dr. Leong Kin Wah at Mahindarama Buddhist Temple, Penang. A team of 12 volunteers left for Ipoh early morning to support the Health Camp organised by Sis Poh Choo of Amata Clinic. Mitta volunteers, were on hand to reiki a stream of devotees waiting eagerly in line. 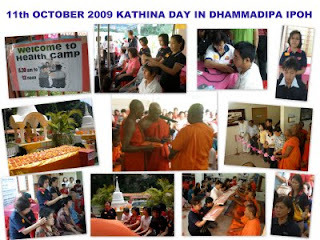 By noon time, although feeling exhausted, we felt a sense of joy after channeling the Reiki energy to the devotees. 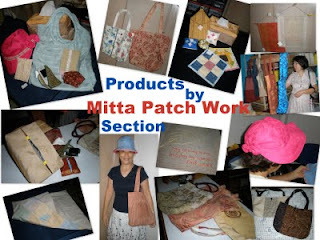 We, Mitta Quilters, have been meeting for several months this year. We started off with some lessons on patchwork and quilting which resulted in a few pieces of patchwork made for Friends at the Centre to keep them warm during Reiki sessions. Our aim is to make items from the beautiful fabrics donated to us in order to raise funds for the Centre. The small enthusiastic group of ladies have produced bags, purses, glass covers, wall-hangings, coasters and a range of attractive items that are especially great as gifts. We are able to price them at an affordable range as workmanship and materials are free. More volunteers are needed to join us at our sewing sessions. We meet on the last two Saturdays of each month from 2pm to 5pm. Do not shy away even if you think you do not enjoy needlework. We will soon get you sewing in no time at all. We assure you an afternoon full of laughter and fellowship, not to mention the food that people very generously bring along to share. See you soon. Do have a look at our products too.